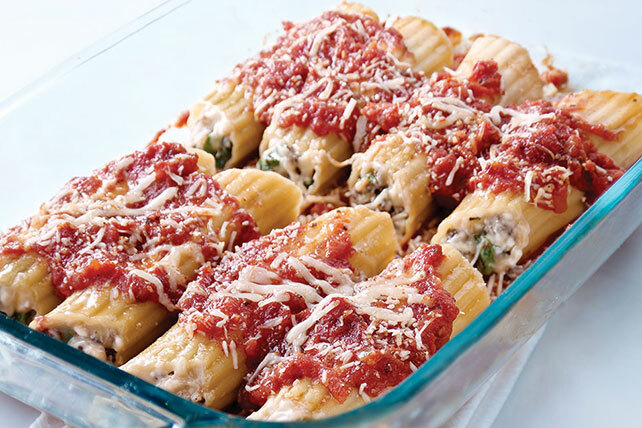 Serve up our delicious Spinach and Triple-Cheese Stuffed Manicotti recipe tonight. Our Triple-Cheese Stuffed Manicotti is sure to surprise and delight. Cook pasta as directed on package. Meanwhile, cook bacon in large skillet on medium heat 4 to 5 min or until crisp. Use slotted spoon to remove bacon from skillet, reserving drippings in skillet. Drain bacon on paper towels. Add onions and garlic to drippings; cook and stir 2 min. Add ground beef; cook and stir 6 to 7 min. or until no longer pink. Stir in bacon, Neufchatel, spinach, mozzarella and herbs. Drain shells; fill with meat mixture. Pour 1 cup sauce into bottom of 13x9-inch baking dish; top with shells. Add water to pasta sauce jar. Cover with lid and shake jar. Pour water over shells; cover with foil. Assemble manicotti as directed. Refrigerate up to 24 hours. When ready to serve, bake in 350ºF-oven 55 min. or until heated through, uncovering after 45 min.